Famous young actor/athlete/endorser, Enchong Dee once again graced the cover of Men’s Health Philippines Magazine for April 2012 as he shares his new interests and trivia about becoming and staying fit. 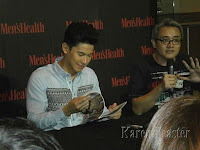 Men’s Health held a launch at Glorietta 5 last March 25, 2012 with Enchong Dee answering questions and sharing more about his personal lifestyle and work together with the media, bloggers and his most enthusiastic supporters. I would like to thank again his most popular and warm fan group, EDW (Enchong Dee World) for hooking me and my friends. Enchong is really a nice and handsome man, no wonder he is well loved by his fans. 1. “I will not be who I am today without swimming.” he states. 2. He has new fitness goals like Triathlon and Muai Thai. There are also plans of trying Jujitsu too. 3. Swimming vs. working: He is now currently prioritizing his showbiz career. 4. No guts on wearing underwear cover or pose for the fashion line he is now currently endorsing. 5. His morning exercise revealed as he demonstrated it in our very own eyes. Men’s Health magazine in now available on bookstores and news stands for only 140Php. Copyright 2006-2016 | All Rights Reserved | © Flordeliz Fullo. Powered by Blogger.